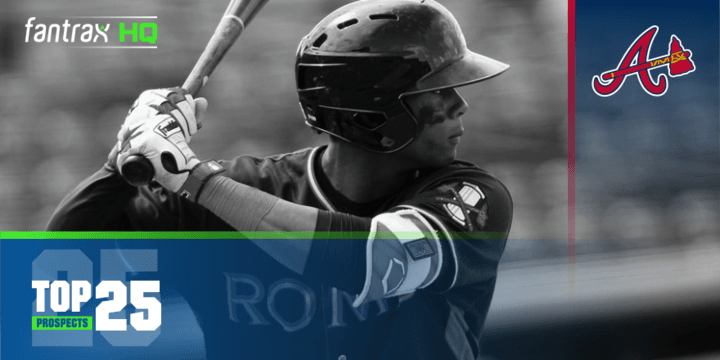 Over the last couple of months, I’ve been digging through each MLB team’s farm system to provide the top dynasty fantasy baseball prospects that should be on your radar. Today, we’ll break down the top-25 Atlanta Braves prospects. Get some popcorn ready. The Braves have long been considered one of the top farm systems in baseball. Yes, there was that whole international signing issue that cost them some of their recent signings like Kevin Maitan, but that aside, this organization has been chalked full of talent for a while, both at the plate and on the mound. I mean, they just graduated some dude named Ronald Acuña and still have one of the top systems around. You may have heard of him. All he did was nearly go 30/20 and win the 2018 NL Rookie of the Year award over my boy Juan Soto. (Insert dad grumble here). This system has so much pitching talent, you could take the number of pitching prospects in this top-25, cut them in half (not literally, that’s some Law & Order stuff) and make two future MLB rotations. Two damn good ones at that. And don’t forget, that’s without Carter Stewart, the Brave’s No. 8 overall pick in the 2018 draft that they failed to reach a contract agreement with. While pitching might be the bread and butter of this system, there are plenty of high-upside position players sprinkled in, starting with the top overall prospect below. There are a few guys that could rank in this top spot, but when it boils down to it, there’s no one from this farm system I’d rather have in dynasty than Cristian Pache. This is also a raw tools over statistical production ranking as Pache’s loud and vast skill set hasn’t quite translated to the production that he’s capable of quite yet. Pache is currently more advanced on the defensive side of the ball with a cannon for a throwing arm and phenomenal range in center field thanks to his elite speed. That speed hasn’t led to consistent SB totals yet, but Pache is still very raw as a base stealer and needs to improve his pitcher reads and selectiveness on when to attempt to steal a base. He’s only been successful on 64.9% of his 77 career attempts and was caught more times (8) than he was successful (7) in 2018. There’s 40-plus SB upside in these legs. There really is. While speed and defense are currently Pache’s carrying tools, there’s plenty of upside offensively as well. Pache uses a balanced pre-pitch setup with hands shoulder high and uses moderate load leg kick to time pitches. Rear leg load and hand coil are synced with the leg kick and Pache explodes through the zone with plenty of bat speed and some natural loft to his swing. He’s still adding strength to his lean 6’2 frame as well and started driving the ball more consistently in 2018, leading to his first nine professional home runs. Now, there’s still a lot of work to be done. Pache is too pull happy at the moment and still hits more than 50% of balls on the ground. And while he doesn’t strike out a ton, the approach is still overly aggressive, as evident by his 4.0% walk rate last season. If Pache can show more patience at the plate and wait for a pitch he can drive, the offensive numbers should start to take off and allow him to hit for both power and average moving forward. Beautiful, isn’t it? Toussaint curveball is a tight snapper in the 77-79 range with hard 1-7 break. When he’s throwing it well, which is quite often, it’s nearly an unhittable pitch. That fastball/curve combination alone could make Touki a dominant bullpen arm, but wait, there’s more! Toussaint also features a split-change in the mid-80s with solid drop and fade. Due to the movement and velocity difference from his heater, with improved consistency of the pitch, it could be a third plus pitch for Toussaint to dominate hitters with. All of this filth didn’t develop overnight. Toussaint has always had a dominant arsenal, but his subpar command and control had limited the effectiveness of his pitches in the lower levels. Improved command in 2018 allowed Toussaint to showcase that filth more consistently and rocket him up three levels, straight to Atlanta. If the improved command is here to stay, Toussaint will have a good chance at fulfilling his upside as an ace-caliber starting pitcher. Enjoy Touki-time Braves fans. It’s a bird! No, it’s a plane! Actually, it’s Drew Waters skyrocketing up prospect rankings. As a 19-year-old switch hitter, Waters terrorized Sally pitchers to the tune of a .303 average, 47 extra-base hits, and 20 steals in 84 games before his promotion to the Florida State League. Waters has a structurally sound swing from both sides of the plate but displays more contact skills and power from the left side. He starts with a balanced pre-pitch setup with his hands a little higher. Hand coil and swing path are fluid and his quick wrists generate plenty of bat speed. He’s more prone to hit line drive shots right now, but as he continues to develop and add strength, 20 homers annually isn’t unrealistic. With his clean swing and plus contact skills, Waters should be able to hit for an average north of .280 as well. While the offensive skills are profound and certainly impressive, Waters is more than just a hitter. He possesses plus speed that has been very apparent both on the bases and in center field where his range has been a real asset. To cap it all off, Waters has a strong throwing arm. Four of the five tools here are above-average to plus giving Waters both a high floor and fairly high ceiling as well as an all-star caliber outfielder. Though with Pache also being a center fielder, and one of the best defensive center fielders in the minors, Waters might need to slide over to a corner outfield spot. “I maybe higher than anyone on Drew Waters. He’s a very good athlete, a plus runner (for now) and an above average defensive CF. At the dish he’s a switch hitter. From the left side, he has fast hands and plus bat speed. He hits frozen ropes up the middle and to his pull side. Despite being a lanky teen he hit a HR clocked at 111 MPH this Summer, the ball really does jump off of his barrel. The approach is aggressive, he jumps on a lot of 1st pitch fastballs but he also shows good bat control and stays on spin. If you want to flip-flop Soroka and Toussaint in these rankings, I won’t argue with you about it. While I believe Toussaint has the slightly higher upside, Soroka has the edge when it comes to floors due to his plus command. A big 6’5 right-hander, Soroka was taken by Atlanta with the 28th pick in the 2015 draft, debuted with the Braves this season, and has impressed at every minor league level along the way. Unfortunately, shoulder woes limited Soroka to just five starts with Atlanta and 56.1 innings total last season. That opened the door for Toussaint to get the call and now this duo will have to battle it out in Spring Training for a rotation spot. Look at the drop on this Mike Soroka fastball at 95mph. As I mentioned, Soroka is a high-floor pitching prospect and has the highest floor of any prospect in this system. His delivery is fluid, repeatable, and mechanically sound. You would never expect mid-90’s with heavy sink on his fastball by watching his delivery. That’s what you call easy velocity right there. Soroka sits in the 92-95 range with that heater and mixes in a slider and changeup that are both above-average to plus offerings. The slider is the better of the two offspeed pitches, thrown in the mid-80’s with hard two-plane break that misses plenty of bats. As long as the shoulder issues don’t linger, Soroka should become a workhorse No. 2 starter with low ratios and around a strikeout per inning. This guy knows how to pitch and get the most out of his rock-solid three-pitch mix. You might be surprised to see Riley this low, and frankly, I didn’t initially expect to rank him this low. We all know about Riley’s plus power upside. Extra-base hits have flowed with regularity throughout Riley’s minor league career and he should have no problems continuing to hit for power in the Major Leagues with a strong right-handed stroke with natural loft. The problem is, Riley’s swing can get a little long at times and he has a tendency to chase too many pitches out of the zone, leading to higher strikeout rates. In both May and August last season, Riley recorded a strikeout rate above 32% but somehow managed to still hit over .300 in both months and finished at .294 on the season. That’s not something I envision continuing in the Major Leagues. Seven Major League hitters struck out at a 28.4% clip or higher in 2018 and the best batting average of the bunch was .266. I’m not saying Riley can’t hit for average moving forward, but unless he improves his pitch selection and shortens his swing a little, his batting average should be more in the .260-.270 range than approaching/exceeding .300. When a pitcher of this caliber can’t even crack his team’s top-5, you know the system is incredibly deep and talented. Anderson was the No. 3 overall pick in the 2016 draft out of Shenendehowa High School in New York. Say that five times fast. Anderson currently sits in the 91-95 range from a nearly over the top arm slot and could add a little more velocity if he fills out his slight 6’3 frame. Both his curveball and changeup are borderline plus offerings, but his spotty command has limited the effectiveness of them at times. That’s really the only thing holding Anderson back from becoming a strong #2 type starter. He repeats his delivery well, though, which bodes well for the potential of improved command as he continues to develop. After taking Anderson, a prep arm, in the top-5 of the 2016 draft, the Braves decided to make it back to back arms in the top-5, grabbing Wright 5th overall in 2017 out of Vanderbilt University. Wright arguably has the best all-around arsenal in this system with four pitches that are average to plus or better offerings. His fastball sits in the mid-90s with strong arm side life and he’ll mix in three offspeed pitches with his hard curveball being the best of the bunch. In fact, everything about his arsenal is hard as all four pitches are on the higher end velocity-wise. His slider and changeup are a little behind the other two pitches, but both still project as above-average pitches for Wright longterm and the slider flashes plus at times when he’s commanding it. Like with Anderson above, refining his command will be key if Wright wants to reach his #2 starter upside. As a prep arm drafted in 2016 with no starts above SIngle-A coming into 2018, it might’ve been a tad surprising to see Wilson make his Major League debut late last season. But if you’ve watched Wilson pitch at all, you can see why the electric right-hander ascended the ranks so quickly. Wilson mainly attacks hitters with his low to mid-90s fastball with good downhill plane and slider with strong two-plane break. The slider has been a tad inconsistent at times, but at it’s best, is a plus pitch. Those two pitches have led to a bunch of strikeouts for Wilson in his minor league career and give him a solid floor as a top-notch bullpen arm. If he can remain a starter and a productive, high strikeout No. 3 starter at that, will be determined by the development of his changeup, which is currently a fringy offering. We take a brief break from a long line of pitching prospects to bring you a high-upside outfielder from Wichita State that won the MVP award for the Cape Cod League in 2017. The Braves selected Jenista in the 2nd round back in June and quickly promoted him two levels to Advanced Single-A. Not one tool sticks out with Jenista but he does possess a bunch of average or above-average tools with no glaring weaknesses to his game. If one tool were to be considered plus, it would be Jenista’s raw power. However, Jenista’s swing doesn’t generate a ton of loft to it and he has a tendency to get out on his front foot too early which greatly limits his game power. As it stands now, he still has enough raw power and bat speed to get into the teens for home runs, but Jenista will need to learn to keep his weight back and add a little loft to his swing if he wants to get up into the mid-20s. There’s some sneaky athleticism here as well that allows him to move well in the outfield and contribute in the stolen base department. With a good feel for hitting and solid plate coverage, Jenista should be able to hit for average as well and profiles as a starting corner outfielder with above-average offensive upside. Okay, back to the mound. Muller was one of four prep arms taken by the Braves in the 2016 draft along with Anderson, Wilson, and Joey Wentz. He’s a big 6’6 southpaw that sits in the low-90’s with his fastball out of a high 3/4 to overhand arm slot. The arm slot has been inconsistent at times which caused his command and overall consistency to be spotty in the lower levels. Muller has done a good job improving his delivery over the last 12-18 months and repeats it quite well now. As the consistency in his arm slot and delivery improved, so has the command of his three-pitch arsenal. In addition to the fastball, Muller throws a curve with 1-7 shape and a changeup with some fade to it. There might not be as high of a ceiling here as with the guys ahead of him, but Muller still has the upside of a strong mid-rotation arm. For those of you that know me and how much I pumped up Gohara last spring, this ranking felt like taking a shot to the stomach from Mike Tyson. But when you have concerns surrounding your command, changeup, and durability, this was needed. Don’t get me wrong, I hated doing it, but I’m no longer 100% sure the hefty Brazillian lefty remains a starter. The 92-96 mph riding fastball and tight slider with two-plane break are both plus or better pitches. When I caught him with Triple-A Gwinnett last April, he had both pitches working quite well, though, his velocity was down a tad as he was rehabbing an ankle injury. Those two pitches would be dynamite coming out of the bullpen, which is where he’ll end up if his changeup and command don’t improve. I’m still rooting for him to remain in the rotation and so should all of his dynasty owners. Work on the changeup big guy! In most other systems, Contreras would likely be well within the top-10. But this is the Braves we’re talking about. Contreras has displayed a solid all-around skill set in the minors since being signed early in 2015. He’s an above average defensive catcher that should remain behind the plate long-term and possesses the offensive tools to make him one of the top offensive backstops around. The setup is different from most with his feet starting barely shoulder-width apart and standing as far back as an umpire will probably allow him to in the batter’s box. There’s minimal load, followed by more of a stride towards the pitcher during his swing. It might look different, but it’s been working for him so far with a .290 career minor league average. Contreras has also shown patience at the dish and above-average power upside as well. He gets lost within this system but is definitely an underrated catching prospect to target in dynasty formats. Another prep arm from the 2016 Braves draft class, Wentz has a strong arsenal but doesn’t quite have the same upside as the guys ranked above him. Working from a high 3/4 arm slot, Wentz is usually in the 91-94 mph range with run on his fastball and will mix in a curve and changeup, both of which he’s shown a good feel for. Wentz has experienced issues with his command off and on since being drafted and missed time with various ailments in 2018, so getting back into a groove early in 2019 will be big for him. Ultimately, he looks like a mid-rotation starter that should sit between eight and nine K/9. If you like safe, Allard is your guy. Honestly, Allard is the equivalent of a 1992 Toyota Corolla. It wasn’t a car that turned heads, but it was reliable and lasted forever. That’s Allard in a nutshell. After cruising through the minor leagues, Allard got a taste of the Majors last season and as you can see above, it didn’t exactly go well. In his one start and two relief appearances, opposing batters hit a ridiculous .463 off him. Allard generally sits around 89-91 with his fastball, topping out at 92-93, with some arm side run. Both his curve and changeup are above-average offerings and Allard has shown a good feel for his entire arsenal and plus command. He’s never going to be one to strike out a ton of batters, but he’s a safe bet to turn into a strong No. 4 type starter. No matter if it’s the 1st round, 4th round, of the 7th round where Weigel was selected, the Braves know how to find pitching talent. Weigel, a big 6’6 right-hander, missed nearly the entire 2018 season recovering from Tommy John surgery that ended his 2017 season prematurely. Before the injury, he was displaying three above-average to plus pitches with the mid-90’s fastball and hammer curve being the best of the trio. His command was an issue earlier in his career, but he was showing improvements there before going under the knife. It will be interesting to see how Weigel’s stuff and command look when he’s back to full strength in 2019. He’s certainly one to keep an eye on. A fourth round pick this past June, Beck is a big 6’4 right-hander out of Stanford University with a projectable frame. He operates in the low-90s with his heater and likely will add a touch of velocity if he fills out his frame more. Though, he’s already 22, so that might not end up happening. Even if not, the fastball is still an effective pitch for him due to the run he gets on it and his above-average command. That’s not even his best pitch though. That honor goes to his plus changeup with good fading action. Beck will also mix in a serviceable curveball that is well behind the other two offerings but is a usable third pitch. After dominating as a reliever in the GCL and Sally, the Braves moved Davidson into the rotation where the results have been a mixed bag. Davidson has the potential for two plus pitches in his low to mid-90’s fastball and curveball, and has flashed an average changeup, though, it’s highly inconsistent. The results as a starter have been good enough so far that the Braves will likely continue to give him that opportunity moving forward. The upside here is either a No. 4 starter or a solid middle reliever. Once you get past all the elite arms in this system, you’ll notice there a very common theme; good stuff, not so good command. Ynoa fits right into that group. While his secondary pitches need plenty of work, Ynoa can really rachet up the velocity into the upper-90s and has struck out more than a batter per inning since coming over from the Twins in 2017. At times, he’s flashed an above-average changeup and the hope is that it will become more effective with improved command. There’s still plenty of time for Ynoa to develop so keep an eye on him and cross your fingers he develops better command and secondary offerings. Here’s your toolsy outfield prospect with contact issues that every one of these top-25 rankings has seemed to have. When Wilson makes contact, it’s usually loud and into a gap. But half of that last sentence is the problem here. “When Wilson makes contact.” The when hasn’t been often and he has a tendency to chase too many bad pitches. The swing itself is long and while he can make up for that at times with quick wrists, that won’t be the case as he continues to face more advanced pitching. If he can shorten his swing and refine his plate approach, Wilson could really take off as a hitter. Until then, he’s just another toolsy outfielder with a power/speed profile to dream on. Taken in the 6th round of the 2018 draft, Moritz possesses four average to plus tools and could be a quick mover through this system. Moritz displayed an advanced plate approach and a good feel for hitting from the left side with above-average contact skills and speed. He’s not the strongest guy in the world, and paired with his mostly linear swing path, there’s not a ton of power projection here. However, with his clean swing and bat speed, it wouldn’t shock me if he snuck into the 10-12 homer range, though single digits is most likely. Still, his above-average contact skills and speed give him sneaky good upside and makes him a name to watch moving forward. The Braves did quite well for themselves in the 2018 draft and might have nabbed themselves a steal in the 20th round. Alexander split time across three levels after the draft, ending the season in the Florida State League (A+). He has the looks of a masher, but is more contact over power at the moment. His swing has a natural uppercut swing path and solid bat speed, so it’s easy to project additional power moving forward. Alexander can also move well for his size, both on the bases and at the hot corner. Keep an eye on him as he advances to Double-A in 2019. After a strong showing in the GCL and Appy in 2017, Ramos advanced to full-season Single-A in 2018. The results were mixed. He was able to cut his strikeout rate, but doesn’t make enough contact or have enough patience at the plate to fully unlock his plus power upside. The upside here is a power hitting corner outfielder that hits in the .250-.260 range if he can start making more consistent contact. If he doesn’t, I’m not sure he ever gets past Triple-A. Big arm, big stuff, big control problems. There, I just summed up Trey Riley in seven words. The 6’2 right-hander with the flowing brown hair can dominate hitters with his mid-90’s fastball and plus slider with two-plane break. But unfortunately, the changeup is nowhere close to a serviceable pitch and he often struggles with his command. As of now, the bullpen is looking most likely where his fastball/slider combination would be tough to hit. The Braves figure to let him develop as a starter for the time being though to see if the command comes around. It’s all about consistency for Tarnok. And by that, I mean lack thereof. When he’s commanding his arsenal, Tarnok will flash three above-average to plus pitches. He’s shown a good feel for both his curveball and changeup and can get some decent movement on both, but the lack of command has really limited the effectiveness of both offerings. The same can be said about his fastball, which has seen the velocity fluctuate. Tarnok has not been able to maintain his velocity deep into starts, which makes me think he ends up in the bullpen permanently within the next year or two. During his time in the pen for Rome in 2018, Tarnok was sitting more in the mid-90s. After entering the professional ranks with high hopes as the #6 overall pick in 2014, Jackson hasn’t done much of anything during his minor league career. The average sits at .234 and he’s struck out in 28.6% of his plate appearances. Jackson warrants monitoring as a catcher with above-average raw power and a strong throwing arm, but I’m really starting to doubt he ever hits enough to overcome his shortcomings. The power is nice, but it’s not THAT nice. Derian Cruz, 2B – Switch-hitter signed in the 2015 J2 period, Cruz has plus speed but needs major work at the plate. Braxton Davidson, 1B – Davidson has easy plus raw power but has such terrible contact skills, I’m pretty sure he’d strike out in tee ball over 20% of the time. Davidson ended 2018 with a puke-worthy 44.3% strikeout rate. Jaseel De La Cruz, RHP – A lively arm in the low minors that could really take off with improved command and some development of his secondary pitches. Thomas Burrows, LHP – A hard-throwing lefty with a plus slider and typical control problems. Could make his way up into the Atlanta pen later on in the season. Chad Sobotka, RHP – The 2014 4th rounder has a blazing upper-90s fastball and a slider that flashes above-average at times, but the control issues limit how good Sobotka can be as a bullpen arm. Finished 2018 in the Braves pen and should open there to begin 2019. AJ Graffanino, SS – A switch-hitting shortstop with a good feel for hitting and above-average contact skills. Graffanino doesn’t project to have much power, but does enough things well on both sides of the ball to reach the Majors and maybe even become a low-end starting shortstop. Drew Lugbauer, C – Plus raw power with a subpar plate approach and contact skills. Also not a great defensive catcher. Up – Touki Toussaint (RHP), Drew Waters (OF). Down – Alex Jackson (C). Photo/Video Credit: Jory Dyvig (Main Article Image), Josh Norris, Pitcher List, Jason Woodell.